Designed in the 1950s to make the diamond industry more lucrative, the process of creating high-pressure high-temperature (HPHT) diamonds is actually having a negative impact on today’s industry. HPHT diamonds are less expensive than their natural counterparts and develop a significantly better color after undergoing this process. Companies purchase cheaper, less desirable diamonds, put them through the HPHT process, and sell the resulting (and better looking) gems at a much higher price. The HPHT process allows manufacturers to select flawed or discolored diamonds and alter them into more desirable colorless, pink, blue, or canary yellow diamonds. To recreate the process that takes place deep inside the Earth’s crust, HPHT diamonds are subjected to extremely high temperature and pressure inside special machines in a lab. Temperatures soar as high as 2,600 degrees Celsius to imitate the naturally occurring heat in the earth necessary to create a natural diamond. The exorbitant cost of the energy and machinery required to perform such a task results in a very desirable (and lucrative) product—a colorless diamond. With many consumers wanting to purchase the “biggest and best” diamond, the demand for HPHT diamonds grew. These enhanced stones allow consumers to get a larger stone with better color for less than what they would pay for a natural diamond of the same specifications—but at what cost? Purchasing HPHT diamonds is not recommended for several reasons. These enhanced stones can show hints of color that is visible from the side of the stone upon close inspection. They also tend to lose some of their original weight and clarity during the process. Even more concerning is that HPHT diamonds tend to be magnetic and some can even be picked up by magnetic force! HPHT can only be used on high-clarity diamonds (VVS1, VVS2, VS1, VS2, and flawless) because the extreme pressure and temperature can cause diamonds with inclusions or fractures to explode during the process. It’s difficult to distinguish natural diamonds from HPHT stones, so some consumers inadvertently purchase enhanced diamonds thinking they are real. 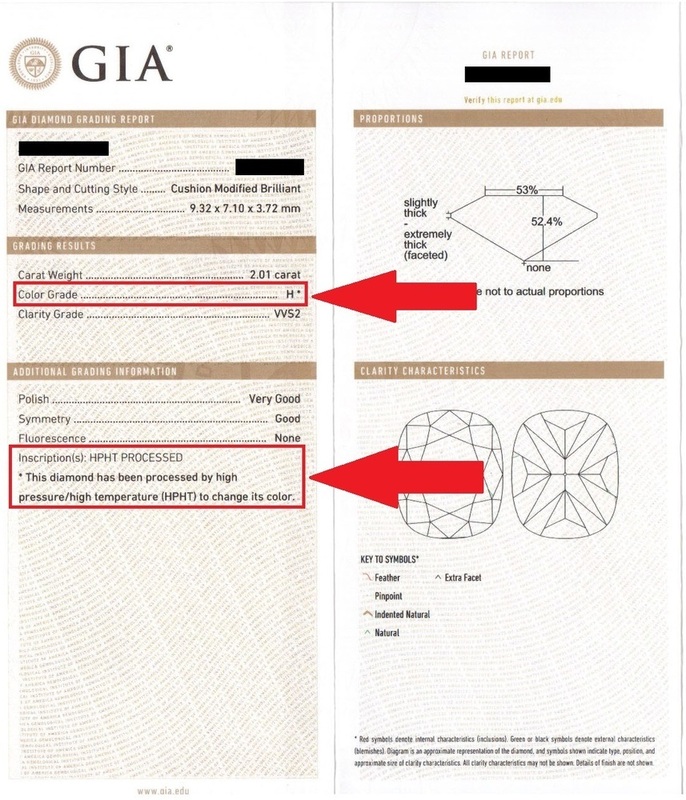 The Gemological Institute of America (GIA) wanted to remedy this situation to help prospective buyers truly know whether they were looking at a natural or enhanced stone. A team, led by the GIA’s director of research, Dr. Wuyi Wang, put diamonds through a barrage of tests to indicate whether they were natural or not. They discovered that in order to differentiate the HPHT from the natural diamonds, advanced spectroscopic techniques needed to be used. An instrument called the DiamondView is used to detect synthetic diamonds by looking for unique spectroscopic telltale features like a lack of natural graining in the stone. Many companies around the globe are experimenting with HPHT treatments, and not all are marking these enhanced stones with proper identification. Therefore, it is becoming more and more difficult for industry professionals and GIA researchers to differentiate between HPHT and natural diamonds. Researchers at the GIA continue to develop new techniques to identify HPHT gems, but keeping up with the developing technology is challenging.